EDIT 8/11/2018: The firmware has been updated to 2.13.8 due to a critical issue found in the 2.13.7 firmware. We have an important firmware update which dramatically improves lap timing for your PodiumConnect system. The firmware update is quick and easy – see below for details. 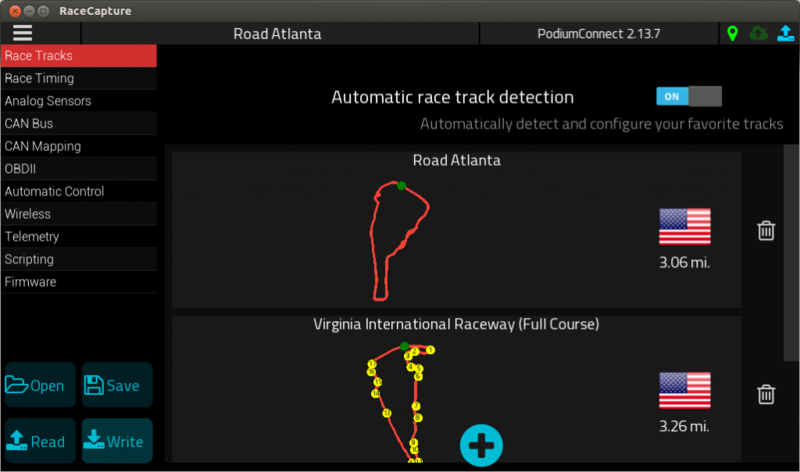 This update dramatically improves lap timing reliability when working with GPS data sources updating slower than 10Hz. When GPS data is received slower than 10Hz, PodiumConnect will now automatically up-sample your data to 10Hz to significantly improve lap timing consistency and accuracy. Download the 2.13.8 firmware package for PodiumConnect, at the bottom of the Downloads Page, or use this direct link to 2.13.8 firmware. Back up your current RaceCapture or PodiumConnect configuration by reading the current from your unit and saving it to a file. When complete, your firmware will report the 2.13.8 version number in the status bar when you connect using the RaceCapture app. Since this is a bugfix release (2.13.6 -> 2.13.8) your current settings should be preserved. If not, just re-load and update your settings from your saved configuration file. While you’re at it, ensure you have all of your tracks listed under Setup / Race Tracks. This is necessary so PodiumConnect can calculate lap times. Fortunately, it’s something you only need to do once! Press the (+) button to browse and select tracks to add them to the list. When done, Write it to your PodiumConnect system. We want to hear how it’s working for you! Let us know by sharing in the forums or our Facebook community.